Kreuz was the first stop on the Central TX BBQ Run. Sometimes, you just gotta have some barbecue. But sometimes, that’s easier said than done. Unfortunately, living in Northern New England means that we’re so far outside the good barbecue belt that most of the attempts to do “barbecue” up here are woefully misguided, with some sort of ketchupy sauce slathered onto some grilled meat and called “good enough”. Sure, there are a few exceptions (go consult the fine guide over at PigTrip, but, in general, the state of affairs is dismal enough I’m surprised that the phrase “New England Barbecue” hasn’t already caused some sort of Civil-War-like incident. So, when I found that several of my online friends from TivoCommunity.com were staging another “Central Texas BBQ Run”, I decided it was well about time I cashed in some free airline tickets and come join them. So, early Friday morning, I got up at the ridiculously early hour of 3am, and drove through the slushy snow to the airport. After a bit of airline drama involving the world’s longest deicing, resulting in a new record for “shortest connection at BWI”, I made it to Austin, where I rendezvoused with my friends and headed off to Lockhart, TX. 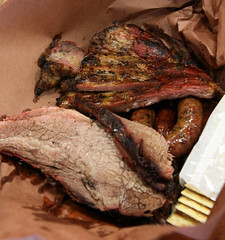 Lockhart, TX claims to be “The Barbecue Capital of Texas,” and it’s not an idle boast (indeed, it was declared such by the Texas state legislature…). Lockhart sports several venerable BBQ joints, with some of them being around for quite some time. The grandaddy of them is Kreuz Market (pronounced “Krites”, by the way), founded in 1900 as a meat market and grocery store by Charles Kreuz. In what’s actually a pretty familiar pattern, Kreuz was primarily running a butcher shop for the prime cuts of meat, and would make sausages from the least desirable cuts, and smoke it and the brisket. That turned into a major business, as well as establishing what are really the two hallmarks of Texas BBQ: smoked brisket and sausage. Being the “Barbecue Capital”, Kreuz has a lot of company in town, including Smitty’s (located in what was the original location of Kreuz, owing to what appears to be a family squabble still recent enough that googling the topic gives several different versions of the story), and Black’s (since 1932, still run by the same family). But Kreuz has history, and was a good place for me to join the adventure (most of my friends had previously hit up Louie Muellers in Taylor, City Market in Luling, and at least one other joint before my sub-group caught up with them). When Kreuz built their current location in 1999, they didn’t skimp. It’s one of the largest BBQ joints I’ve been to (while it’s been a few years since I’ve been there, Angelo’s in Fort Worth is pretty substantial in size as well), with a few thousand square feet of storage and a wide, open indoor smokeroom for making the goods. So we walked up to the counter, and followed our primary M.O: Buy several pounds brisket (asking for both fatty and lean end cuts… do I need to do some brisket anatomy for my readers? ), one or two sausage links for everyone, a handful of pork ribs, and if they’ve got something else special, order some of that as well. In Kreuz’s case, that would be prime rib. The kitchen staff piles it on kraft paper, gives you some extra paper as “plates” and you are on your way. We’d hack it up amongst ourselves with a few knives (no forks, and no sauce, for that matter, they are purists), and start eating. So how did Kreuz do? It wasn’t a bad place for me to start this BBQ adventure, since everything they had was a few notches above what you can easily find in the Northeast. The prime rib was excellent, what would be called fork-tender (if you had forks), and with just enough smoke to flavor it. The brisket was actually a little hit and miss: the fatty end of it had a nice bark (the crust from the meat caramelizing with the rub, for you BBQ newbies reading this), a decent smoke layer (the dark layer from the smoke directly penetrating the meat), and good flavor, but the lean end was definitely on the tough side (in their defense, we came at ~3pm, which isn’t the greatest time to show up, stuff might have been sitting in the smoker too long). Good, but we did a lot better during the weekend. The pork ribs were good as well, but not remarkable, especially since my travels take me to plenty of Southern places with decent pork ribs. 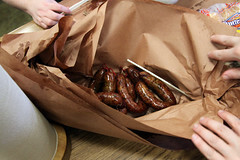 What really shone for me was the jalapeno cheese sausage, which really had a good package going: the casing wasn’t too tough, the grind coarse and juicy without being way too greasy, and the jalapeno giving it a really pleasant kick that worked well with the smoke and the meat. Overall, I rather enjoyed Kreuz. It has some history (although the building itself is a relatively new venture), they are purists about serving it up the “right way” (no sandwiches and other nonsense polluting the menu), and definitely puts out a good product. It’s a nice baseline of comparison for the other places I’ll be reviewing later. I certainly wouldn’t hesitate to direct people there, they’ll get some great BBQ at a decent price. You can get a sammich at Kreuz’s. You just have to build it yourself. Couple slices of squishy bread, bang goes the meat on top, and you’re home. Jeebuz H. Kreuz, that’s a good sammich! Once my friend Steve’s wedding was over, we still had another day to check out more of Marin County. After considering a lot of day trips, we ended up taking the ferry to Angel Island for a day of hiking, and afterward we drove around to Sausalito again to check out one of the top-rated sushi places in the Bay area: Sushi Ran. I’m rather glad we did.